Gift Shop at Pontefract Castle01977 723 440work ShopVisit the gift shop and treat yourself to a memento of your visit to Pontefract Castle. There's something for everyone, including pencil case fillers, housewares, sweets and history books. You will also find a fun selection of toys, wooden swords, dress up items, cuddly toys, children's books and small souvenirs that would make a perfect gift for a friend or family member. Visit the gift shop and treat yourself to a memento of your visit to Pontefract Castle. 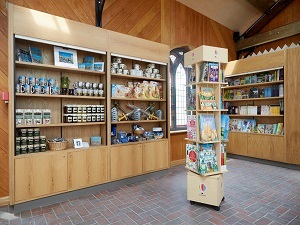 The gift shop is located in the Visitor Centre, open 7 days a week 11am to 3pm. Includes, cafe, gift shop, museum displays and activity zone.